For most of us, the end of a good holiday season translates to an elaborate NYE bash. As joyous as it may feel, this is the time of the year that tends to drain the wallet. If you are one of those who don’t believe in ringing in the New Year silently, here are 7 smart ways to paint the town red without making the pockets bleed. Do you really need a room full of strangers, a handsome cover charge and overpriced drinks when you have four walls that can entertain people you actually like? It’s simpler and definitely more fuss-free to round up people who don’t already have plans, make it BYOB, curate a killer playlist and you’re all set to ring in the new year. Dinner parties, though a lot of fun, can go heavy on the pocket. Instead, you can get a lot more food going around on a frugal budget by serving a flow of munchies through the night. This can not only let your guests eat at their own pace, but also help them from getting overindulgent on the drinks. If you have friends or family living in a slightly more interesting place than you, consider seeing if you can spend the evening with them, making it a mini-getaway. That way you get to not only ring in the new year with people you like, but also travel a little. Although the straight bubbly is traditionally used for ringing in the New Year, you can consider serving a festive sangria or champagne punch leading upto the big strike. If you are hosting your guests at home, you can turn tasty lattes and ciders into something that will keep your guests warm. Getting to and from a party is often difficult considering everything is largely shut down and public transportation is scarce. To alleviate the problem, you might consider planning the evening such that you can stay over at a friend’s place or like advised before, host a party. But if you must get transportation, keep timetables of local transportation handy to plan your exit accordingly. Yes, we all love doing up our place to ring in the New Year. But you can consider reusing some of the Christmas decors like the fairy lights and candle. Also, avoid decorations with the year printed on it. You want to be able to recycle them for future parties. One of the most expensive purchases of this evening is obviously the booze. If you are partying outside, be sure to choose your alcohol and the number of rounds wisely. But if you are hosting one at home, you may consider serving a few homegrown bands, stick to more economic alternatives or even invite the guests to BYOB. 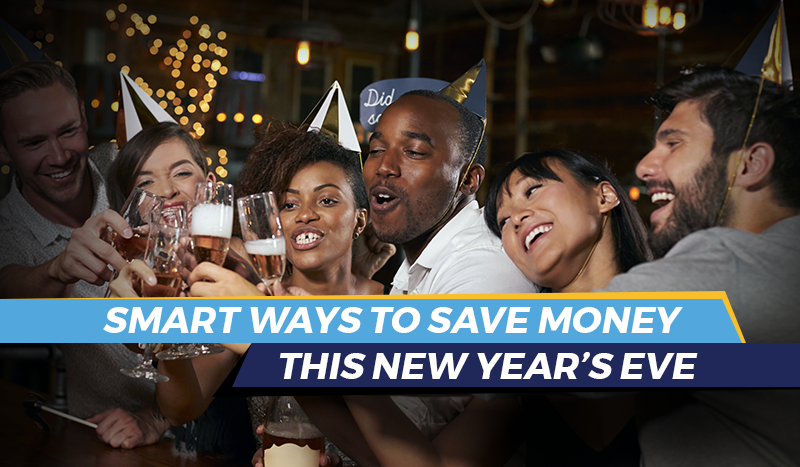 Saving money need not cease with the NYE bash. Make it a resolution this year to save all you can on overseas money transfers. Try InstaReM for sending money at real-time FX rates this 2018, and save up more on international money transfers.